Lethal is 'Always Hawthorn' Leigh Matthews reflects on his time at the club and explains why he is 'Always Hawthorn'. Birchall is back in action during pre-season training. HAWTHORN'S straight-sets finals exit cost All Australian defender Grant Birchall the chance to make a surprise September return this year. Birchall, who turns 31 in January, has endured almost two years of knee-related heartache, playing only five games in 2017 and none in 2018 as repeat setbacks postponed his comeback. The plan for the four-time premiership-winning Hawk was to play half a game for Box Hill in the VFL if Hawthorn defeated Melbourne in their semi-final, before trying to earn AFL selection for the preliminary final. A minor adductor injury, related to "muscle overload" as he moved back into skills training, had already thwarted Birchall the previous week. The Demons, of course, eliminated the Hawks from the flag race in a 33-point result that also erased any thoughts of Birchall playing football this year. 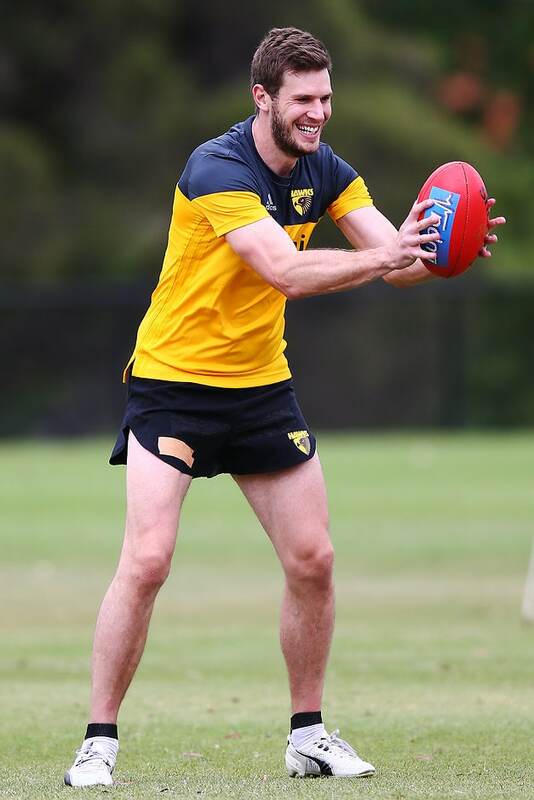 Birchall says he is fighting fit again and aiming to be in Hawthorn's round one team in 2019, although he will be on modified duties until Christmas. "It's been a frustrating 18 months, it's fair to say, but I'm feeling really good, the knee's in a good spot and I'm right to go for day one (of pre-season), so I'm looking forward to it," he said. "I was close (to playing in the finals series), but then I had little interruptions as I was coming back, so I had a little hammy and a little bit of a groin (problem). "If we had beaten Melbourne in that final, the plan was to play half a game in the twos that weekend, then try and get back for West Coast the week after, but it didn't eventuate." Birchall first suffered the posterior cruciate ligament injury in his right knee against Melbourne in round seven last year, in his first match back from a broken jaw. He returned in round 14 and played the following week before going back on the sidelines then being booked in for a PCL reconstruction one month later. Birchall, who averaged nearly 22 matches in his first 11 seasons in the AFL and has played 245 games in total, has not appeared since, also undergoing a pre-Christmas arthroscope last year. His return date was continually pushed back, with soreness and swelling developing in his knee each time he increased his training loads, but a tweak to his rehabilitation program finally did the trick. "It can be a bit of a lonely place being in rehab for a while, but you keep yourself occupied and you certainly learn a lot about yourself and a lot more about the guys, I guess. "I enjoyed added responsibility being more of a leader (working closely with young defenders James Sicily and Blake Hardwick) and it was good in that way." Birchall, who is out of contract at the end of the 2019 season, said he would be "smarter" about his season preparations for the rest of his career. He will be a virtual recruit for a Hawthorn side that hopes to contend for next year's premiership, with big-name recruits Chad Wingard and Tom Scully joining the cause. "It's a good group of players, so hopefully we can all jell as quick as possible and who knows?" Birchall said. "You don't know in this day and age, anything can happen, so we'll just focus on how we can get better."